White-tailed deer are ubiquitous in the Eastern and Midwestern states. They are like pigeons or raccoons or brown rats, suddenly making appearances in the most human-dominated environments, and if you’re from this part of the country, you won’t bat an eyelash. The deer are here, just as the sun shines or the rain falls. But the odd thing about white-tailed is the species is unusually old. Kurten and Anderson claim that oldest remains of the species have been dated to 3.5 million years old. The deer has done well in all those years, and it is often said that the white-tailed deer is the ancestor of both the black-tailed deer and the mule deer. The black-tail evolved when an offshoot of the white-tail became isolated along the Pacific Coast some 2 million years ago when the glaciers advanced through to mid-continent. As those glaciers retreated, the white-tail expanded west once again, and the black-tails that had colonized the arid and montane parts of the interior West apparently crossed with them. Valerius Geist made much hay about the white-tail mitochondrial DNA that is now found in mule deer, as did I. Using Geist’s ideas, I even posited that the mule deer was a species younger than the domestic dog, because it is a true hybrid species that only evolved within the past 10,000 years. Since Geist wrote his book on deer biology and taxonomy, most researchers have generally not followed his lead. Most experts consider the black-tail and the mule deer to be the same species, and the best analogy to think of these two forms is they mirror our classification of brown bears on this continent. If it is a large brown bear from Pacific Coast, it’s called a brown bear. If it is a small brown or “grizzled” bear from the interior West or interior Alaska, it is called a grizzly. The only exception to this rule is all brown bears in California were called grizzlies, even though California did have large coastal brown bears. 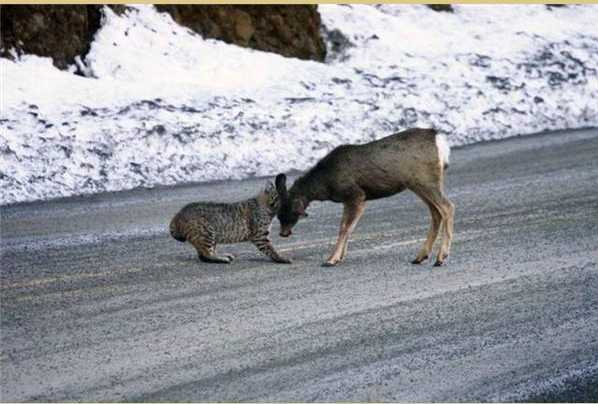 This is pretty much the geographic distinction that is applied to black-tailed deer versus mule deer. Black-tails live along the coast, while mule deer live in the interior. Most authorities generally don’t pay much attention to the odd similarity between mule deer and white-tail mitochondrial DNA. Mitochondrial DNA is inherited from the mother, and it is possible that there really was a female white-tail that bred with a male ancestral mule deer some 10,000 years ago. For whatever reason, virtually all mule deer descend from this female white tail, even though the bulk of their ancestry is that arid-land black-tail stock. This suggestion has been pooh-poohed because modern white-tail/mule hybrids have a low survival rate in the wild. They inherit a mixture of the mule deer’s evasive stotting behavior and the white-tail’s evasive bounding behavior, and deer with such mixed behavior more easily fall to predators. But it is possible that a hopeful monster sort of appeared from this ancient hybridization, a hybrid that had a good enough evasive behavior to avoid predation and pass on her genes. White-tailed deer are among the most studied of all wildlife, but the literature on their DNA is rather sparse. We know from their recent history that white-tailed deer were very close to extinction by the turn of the twentieth century. Industrial-level slaughter for their much coveted hides, which were in great demand for work clothes, had reduced their numbers throughout their range in the United States. Packs of free-roaming dogs killed fawns and ran down the adults, and market hunters sold the venison to restaurants as exotic fare. State after state passed conservation laws on white-tailed deer. States began to transport deer into deer sparse regions, and by the middle part of the twentieth century, deer numbers had recovered to allow some hunting. By the time I was born in the 1980s, there were more white-tailed deer in North America than there were in 1492. Such a boom and bust history surely has left a legacy in white-tail DNA. As the older species, I would expect white-tails to have greater genetic diversity than the mule and black-tail species. But maybe not. The white-tail likely underwent a severe genetic bottleneck as a result of all that unregulated hunting and dogging. Maybe they really are really quite inbred after all. Of course, that diversity could have been somewhat captured if deer from Mexico and Central and South America would be included in the studies. Yes, white-tailed deer, unlike Mule deer and black-tails do range south of Mexico. One of my most prized possessions is a shed antler from a Columbian black-tail that was given to me by a friend who came to visit us from Oregon this summer. (Check out her blog here). It wasn’t the biggest shed I’d ever seen, but it looked like a sort of hybrid between the mule deer and the white-tail. It was of a creature from a different forest, where the evergreens dominate and the rain falls all through winter. Our white-tails are creatures of the oak woods and the cornfields, where the snow falls in the winter and air gets so cold it cuts you like a knife. But they are kin, connected by that common ancestor in that primal white-tail of 3.5 million years ago. Their kind were here long before humans ever stepped foot on this continent, and the thrived through the long days of the fellest predation from bone-crushing dogs, running hyenas, and saber-toothed cats. Our humanity can cause their destruction, but at the same time, we’ve created a true deer utopia of sorts, as we’ve killed off all the wolves and cougars and most of us don’t even bother to carry a gun in the woods anymore. But just as glaciers advance and retreat and the fortunes of predators wax and wane, so too will this utopia. Climate change and development are already taking a toll on mule deer numbers, as are the growing populations of traditional predators. Evolution has set these deer on a course with our own kind’s meteoric rise. We have conjured and conjoined and manufactured and manipulated until we now exist as near deities on our own planet. Near deities, maybe, but we are also surely aliens. So from our deer parks of suburbia we will watch them with benign curiosity, and maybe we’ll take time to know them, to ask about them, to consider them more closely. And do not for a second consider them or us fixed in our places in the grand scheme of the cosmos. One of the more interesting stories of the past week comes out of Polk County, Wisconsin. A bow-hunter killed a mule deer. That may not sound so weird, but the thing is mule deer are a Western species. Wisconsin is home to white-tailed deer, which are the most common species of deer in the East and Midwest. The bow-hunter who took the deer is named Randy Haines, and when he saw the nice little buck get within range he took it. The tail gives it away. If you didn’t see the weird forked antlers, you’d still know that you were looking at mule deer by that scraggly tail with the black top. And if that didn’t give it away, if you spook a mule deer it stots like an impala, while white-tailed deer are quick bounders. 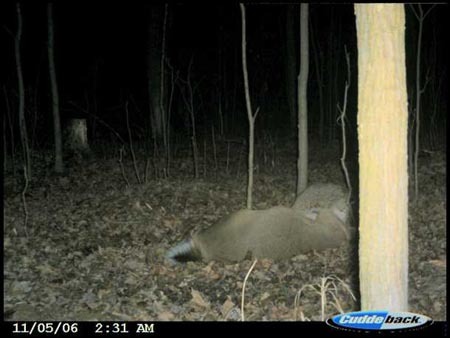 What this deer is doing in Wisconsin is a good question. The nearest mule deer to Wisconsin are in the Dakotas. The mule deer had no tags on it that would indicate that it had been on a deer farm, but that seems like the most obvious answer. However, there is no proof that it is a deer farm escapee. Because we have had such good public management of deer in the US, we know where each species belongs. This is unlike England, where only two species of deer are native and it’s not exactly clear where their historic ranges were. England’s deer were managed using the deer park system, which is not entirely different from the private deer farms that are being promoted in some parts of this country. In both systems, deer are confined to an acreage and managed as a private entity. Deer that aren’t even native to the region, such as fallow deer (the epitome of a park deer), are brought in. If private hunting ranches in Texas are bringing in axis deer, it would make sense that a private deer preserve in Wisconsin would be trying to stock mule deer. But this raises important questions about private deer operations. 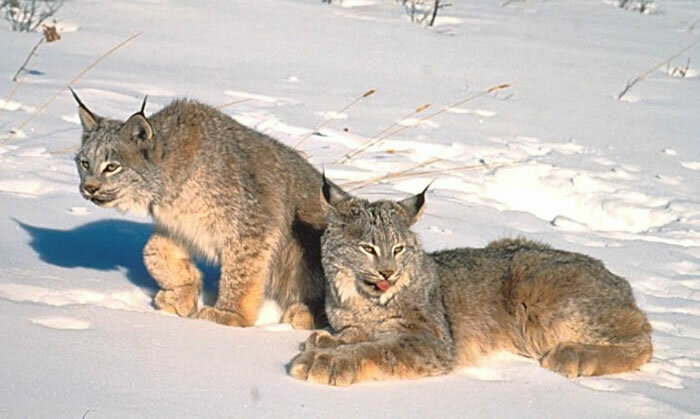 The American model of wildlife conservation is based upon the wildlife being managed as a public trust. When we start allowing people to keep large preserves full of monstrous white-tails and exotic deer, we are undercutting what has worked with deer management here. The specter of chronic wasting disease is always on the horizon with these private deer operations, and if it winds up hitting the publicly held deer herds, then it will be upon the taxpayer to fix the problem. So yes, it’s really cool that someone did kill a mule deer in Wisconsin, but let’s hope it’s the last. For the sake of the deer and deer hunting. Depending upon how one classifies the black-tailed deer, the mule deer may be the youngest species of deer. Valerius Geist posits that the mule deer derived from hybridization between black-tails and white-tails following at the end of the Pleistocene, and they may have only existed in their current form for as little as 7,000 years. Our species hasn’t been around very long. The first Homo sapiens appear in the fossil record about 200,000 years ago. When one realizes that many other species are significantly older than this. For example, white-tailed deer have been around for 3 million years. They are the oldest extant species of deer, and they have existed in almost exactly their same form for a very long time. However, not all deer species are that old. It turns out that a close relative of the white-tail isn’t that old at all. Most North Americans have direct experience with either white-tailed deer or the mule deer. They are the two most widespread deer species in North America, and they are both major game animals. The white-tailed deer is more of habitat generalist, which is probably why they have been around so long. They are also one of the most widely distributed species in the Americas, ranging from Canada to parts of South America. Mule deer, by contrast, are almost exclusively creatures of the American West. They range from the Yukon to Central Mexico and are also found in Southern California and the Baja Peninsula. The two species are in the genus Odocoileus. The white-tailed deer is known as Odocoileus virginianus, and the mule deer is callled Odocoileus hemionus. The two animals can hybridize, producing fertile offspring. However, virtually all recorded hybrids have been captive. Only in a single population of mule and white-tailed deer in Texas has significant hybridization occurred between the two species. These hybrids have managed to survive in the wild and pass on hybrid genes to their offspring. 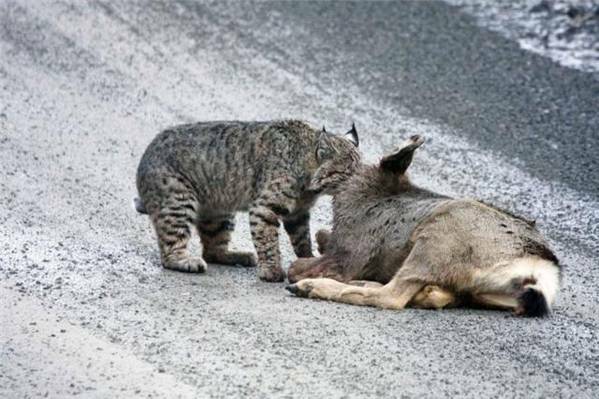 This almost never happens with other contiguous white-tail and mule deer populations. One reason why hybridization has not been significant between the two is that hybrids have poor escape behavior. Mule deer stott when they are pursued by predators. The stott is a high leaping behavior that gives the deer more leverage going uphill. White-tailed deer bound and gallop, which is a very efficient and rapid mode of locomotion. This is very useful for a species that evolved in woodlands and constantly had to worry about predators ambushing it. If a predator can ambush you, the best thing to do is run hard and fast at the first sign of danger. Hybrids between mule deer and white-tails have erratic escape locomotion. Even 7/8 mule deer and 1/8 white-tail hybrids failed to produce the stotting behavior. Even though the two species can produce fertile offspring when crossed, it is likely that the erratic nature of the escape patterns of their hybrid offspring keeps them distinct species. With an erratic escape pattern, the hybrid is very quickly killed by predators– and thus does not contribute to the gene pool of either species. One would think that such a significant difference between white-tail and mule deer would clearly suggest that the two species split from each other at some point in the distant past. But here you’d be wrong. One of the problems in understanding how mule deer evolved is that there has always been a tendency to include the black-tailed deer (Odocoileus columbianus) as a subspecies of mule deer. This deer is found on the Pacific Coast from Northern California to Alaska. It is a creature very much associated with the marine temperate forests of that region, and it does readily cross with mule deer where their range overlap. These hybrids normally survive quite well in the wild, so it is just normally assumed that these two animal represent the same species. Black-tailed deer stott, just like mule deer, so there are no issues with the erratic escape pattern that mule deer/white-tail hybrids exhibit. I think that considering black-tailed deer and mule deer the same species is an error– and an error that may prevent us from understanding what a mule deer actually is. Using both the fossil record and mtDNA evidence, deer expert Valerius Geist clams that the black-tailed deer first evolved about 2 million years ago from the ancestral white-tailed deer. Some white-tails were separated from the main population due to the massive glaciation that occurred at the time, and they evolved very differently from the main white-tail species. Geist contends that genetic analysis shows that black-tailed deer are most closely related to the red brocket deer of South America (Mazama americana), which suggests that they evolved from an ancestral white-tailed deer in the Southwestern US, Mexico or Central America before colonizing the West Coast of the United States, Alaska, and Canada. Then, around 12,000 years ago, the glaciers disappeared, and the main white-tailed deer population entered black-tail territory. They crossbred, and they hybrids began an evolutionary journey of their own. These hybrids were able to survive in the wild. Perhaps stotting versus galloping issue wasn’t such a big deal in those days, or there were just a enough hybrids with the proper stotting gait to survive and found a distinct species. The hybrid white-tail/black-tails evolved to live in the cool, semi-arid regions of the American west. They grew larger and more robust. Their tails became much more unique from their parent species. White-tail and black-tailed deer have white on the underside of their tails. Black-tails have a black tail tip, which is where they get their name. Mule deer have a proportionally smaller tails, which are all white, except for a black tip at the end. Geist’s analysis strongly suggests that the creature we call the mule deer only evolved at the end of Pleistocene– and it may not have existed in its current form until 7,000 years ago. 7,000 to 12,000 years is a very short time for a species to be around. Humans began the transition from hunter-gatherer societies to horticultural societies only within the past 10,000 years, and the new dates for the beginnings of dog domestication are at least 27,000 years ago. The mule deer is actually a younger organism than the domestic dog. White-tailed deer and mule deer have nearly identical mtDNA, but black-tailed deer have very distinct mtDNA. 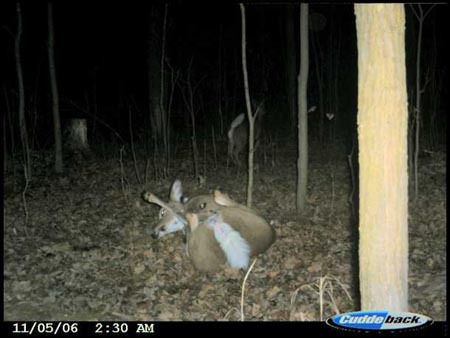 This suggests that this initial hybridization was between black-tailed deer bucks and white-tailed deer does. It also suggests that we should consider the black-tailed deer a unique species, even though it is traditionally considered a subspecies of the mule deer. If we posit this taxonomy, then we can clearly see what a mule deer actually is. It is a species that is more reproductively isolated from white-tailed deer than wolves and coyotes are from each other, but it’s much younger than the 1.8 year split that is normally suggested for those two species. If Geist’s analysis is correct, the mule deer is a good example of a species rapidly evolving from hybridization between two extant species. Of course, we need more study to see if Geist is actually correct. All the studies on deer molecular evolution have examined mitochondrial DNA, which can lead to massive errors. We need nuclear DNA and y-chromosome studies. It may be that the different mtDNA lineages within the Odocoileus species have gone extinct over the years. After all, as strange it may sound now, North American white-tailed deer very nearly went extinct in the early twentieth century. It is possible that there were once white-tailed deer mtDNA lineages that were much more closely related to black-tailed deer than the current specimens. One would expect a lot of mtDNA diversity in white-tails– simply because it’s such an old species. 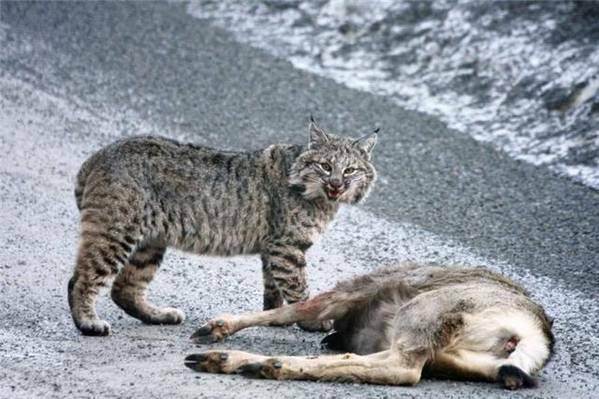 All of these issues would cast some doubt on Geist’s theory, because it could be that the blacktails are a more recent species than the mtDNA evidence would suggest– and then mule deer would be a more ancient lineage. And the case that the two are the same species would be strengthened. So we need more analysis with nuclear DNA and with y-chromosomes to see exactly how these deer evovled, but if Geist is correct, the mule deer is a really new species with a hybrid origin. One might have expected to see smaller species evolve from ancestral stock within this time period, but the evolution of a species as large as a mule deer is a bit of a shock. Normally, speciation can be more rapid with smaller species that have more limited ranges and shorter generations. Limited ranges can lead to greater isolation, and shorter generation times can lead to lineages becoming more distinct over a shorter period of time. Geist’s hypothesis is really quite interesting. It raises so many questions about deer taxonomy and how rapidly species can evolve– even from hybrid stock. So although the varius Odocoileus deer of North America may seem banal, they actually are far more mysterious than one might assume. One on hand, we have the oldest extant deer species in the white-tailed deer. 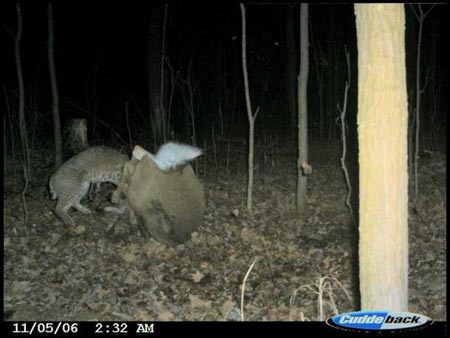 On the other, we have two other potential species, one of which might represent a unique offshoot of the white-tailed deer family and the other might be a very recently evolved species that evolved from hybridizing between the main white-tail lineage and the offshoot. What we may be seeing here is what happens when a species complex begins to separate into fully distinct species. This speciation might be too recent for less sophisticated analyses of genetic material to grasp. But it’s clear that mule deer and white-tailed deer are clearly distinct species. 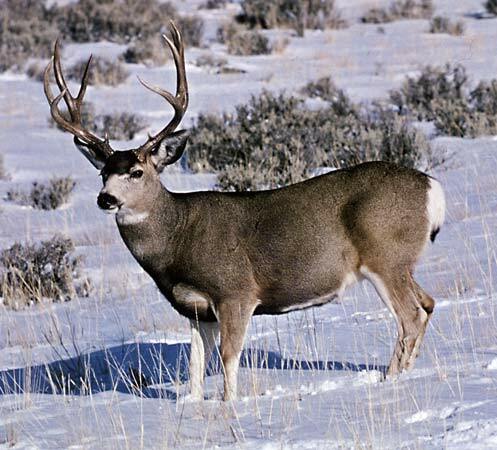 If they were still within a species complex, we would see white-tail genetics swamping mule deer all over the West. White-tailed deer are continually expanding their range. They are not currently hybridizing with mule deer or black-tails, but that doesn’t mean they didn’t do so in the past. Evolution can happen from lineages diverging and from lineages combining. And in the case of these deer, evolution has worked both ways. Now, in addition to Geist’s analysis, there are those who contend that the mule deer aren’t a recent species at all, and that there are actual fossil records of mule deer existing before the Pleistocene. Geist based his analysis on mtDNA. Y-chromosome analysis and some nuclear DNA markers found that mule deer and blacktails were quite similar. That’s not all that surprising. But why do white-tailed deer and mule deer have nearly identical mtDNA and blacktails very different mtDNA? Further, you have to be careful with using fossils. Fossils have fooled people for decades. I am reminded of Ron Nowak’s theory that the red wolf represented a unique ancient wolf lineage that was endemic to the American South. He based his analysis entirely upon fossils and comparative morphology. And it’s been upon Nowak’s analysis that we have determined that the red wolf is a critically endangered species. All the remaining “pure” red wolves that were roaming East Texas and Louisiana were captured, and then they were bred together in a captive breeding facility in Washington State. In the mid-90’s, they were “reintroduced” to North Carolina. Recent genomic analyses have found that this so-called ancient species is nothing more than a large coyote with some relatively recent wolf ancestry. More research has to be performed upon Odocoileus deer, and the studies have to include very large samples of nuclear DNA. I’ve not seen any explanation of how mule deer and white tails can have such similar mtDNA and of how blacktails and mule deer can have such similar y-chromosomes other than a suggestion that they are hybrids. Perhaps the pre-Pleistocene “mule deer” was nothing more than early form mule deer-like Odocoileus in the same way Nowak’s ancient “wolves” resembled the large coyotes we call red wolves. More research must be done, but I don’t think we can say we’ve fully falsified the hypothesis that the modern mule deer is a recent species that is distinct from the black-tailed deer. I think the most likely case from examining the literature is that Geist’s hypothesis is most likely, but we need more sophisticated genetic assays to test it fully.